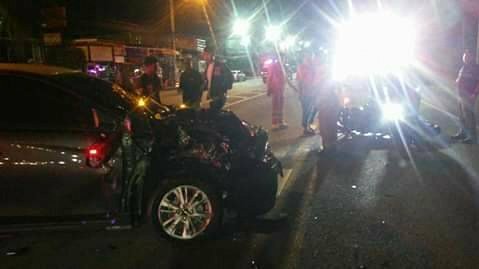 Two tourists were killed when the motorbike they were riding on struck a car that made a U-turn on Chao Fa West Rd, Chalong, last night (Nov 29). One of the tourists killed has since been confirmed to have been 26-year-old Algerian Muay Thai boxer Amine Halimi. not two women tourists as initially reported by police. The error is sincerely regretted. Lt Col Tada Sodarak of the Chalong Police was notified of the accident, near the Land & Houses Park Phuket entrance (see map below), at 11:30pm. Chalong Police officers and an emergency response team from the Ruamjai Rescue Foundation arrived at the scene to find askew across the road a grey Phuket-registered Toyota Camry – still bearing red ‘dealership’ licence plates – with heavy damage to its front-right panel and bonnet . Nearby was a black Phuket-registered Kawasaki motorbike, described as a “big bike”. Present at the scene was driver of the car, Sudapon Nontawat, and her female passenger, Kamontip Jansin, who had suffered minor injuries in the impact. On the road were the bodies of a man and a woman**, who police described as tourists. Police have yet to identify the man** who was riding the bike, but the woman who was riding pillion was identified as Zehre Yalcinkaya. The nationalities of the women were not given. After questioning witnesses, police noted in their report that the car allegedly made a sudden U-turn, and the motorbike could not avoid the collision. The car was impounded and taken to Chalong Police Station as evidence. The bodies of the two tourists were taken to Vachira Phuket Hospial, in Phuket Town, police noted in their report.